Today we are happy to announce Google Adwords Integration in Swydo. With the Adwords integration you can connect Adwords accounts to website profiles and reports key metrics within Swydo. 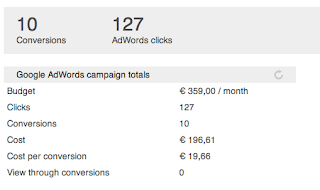 Consultants and clients now can see the highlights of their Adwords accounts and act upon. Within Swydo you now have your tasks, services and key online marketing metrics all in one place. Available metrics include the Budget, # Clicks, Conversions, Cost, Cost per conversion and View through conversions. We think these are the most important metrics. The configuration of Adwords with Swydo is just a matter of 2 clicks. All you have to do is grant access to your Adwords account and select the right Adwords account for the website involved.